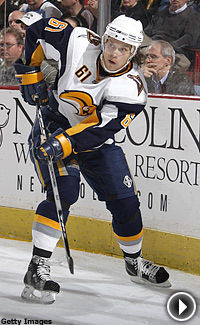 Maxim Afinogenov was the Sabres third round choice in the 1997 NHL Entry Draft. At this time last season, the Buffalo Sabres were on their way to franchise-bests of 53 wins and 113 points as well as their first Presidents' Trophy. Now, Buffalo heads into their game with Tampa Bay on Wednesday battling for the last playoff spot in the Eastern Conference with 79 points, three shy of the Philadelphia Flyers, who currently hold the eighth and final berth. The Sabres started last season with 10-straight wins, but after a mediocre start this season, they dropped 10 straight between Dec. 26 and Jan. 16. That mid-season slump, combined with a slew of injuries, prevented the Sabres from finding any consistency. "Last year at this point we were already in the playoffs, so it's different," forward Maxim Afinogenov said. "That 10-game stretch really set us back and we've been battling injuries, so it's been hard to get any streak going, really." Afinogenov has battled a groin injury that has limited him to just 47 games this season. But while the eight-year veteran acknowledged his injury and the team-wide injury bug this season, he also admitted he can play much better than the nine goals and 16 assists he has to this point. Afinogenov had 134 points the last two seasons, and he knows if his team is to make the playoffs and have a chance to advance once they get there, he will be depended on to replicate his past offensive success. "I know I need to definitely put more pressure on myself to deliver and score goals and I'm trying my best to be better out there," Afinogenov said. "We all need to step it up and do our best now to get in and go far." Another reason for the Sabres' struggles this season has been the losses of Daniel Briere and Chris Drury. Afinogenov did not argue that the team needed an adjustment period, but he also alluded to the development of the team's young core and how they still were adjusting a bit to playing larger roles. "You look at guys like Thomas Vanek, Drew Stafford, Michael Ryan, Jason Pominville, Derek Roy, and yes, we missed Drury and Briere, but I think still having this young core was key," he said. "Players like these that come up through the system, it takes a bit, but they are now a huge part of our team and they need to stay here." Lately, coach Lindy Ruff has been using Afinogenov on a line with Vanek and Ales Kotalik. Afinogenov really enjoys the dynamic talents of this line and has been very impressed with Vanek's work ethic. "He really works hard and always goes to the front of the net," Afinogenov said. He also likes the creativity and shot of Kotalik. "I think he's a very creative player and I think he's a great shooter on the one-timer so with that this a good, balanced line," Afinogenov said. While Afinogenov knows his team will need him and his linemates to light the lamp more, he also knows the Sabres would not even be fighting for a playoff spot now if not for the play of goalie Ryan Miller. "You know, he's just been amazing," Afinogenov said of Miller. "Maybe people don't see it because of our record, but we're not here right now without the game he has played. The goalie is half the game, as they say in Russia, and in the playoffs here, even more so we're lucky to have Ryan back there." With nine games left, starting Wednesday at home against the Lightning, Afinogenov and the Sabres will try to earn a ticket back to the playoffs, and from there, you just never know. "We have the experience, getting to the (League) semifinals the last two seasons, so if we get in, you just never know," Afinogenov said. "We still believe on this team and we're playing to go as far as we can." Shootout Summary -- The Bruins lost 2-1 Sunday to the Capitals in a shootout. Alexander Semin and Viktor Kozlov beat Alex Auld in the shootout frame while Cristobal Huet stopped both Boston shooters. The Canadiens lost to the Blues, 4-3, in a shootout Tuesday. Blues forward Brad Boyes scored the lone goal in the shootout, as well as one in regulation, to lead St. Louis. Who's hot? -- The Sabres have won two straight to remain in the playoff hunt. One reason has been the distribution of offense throughout their lineup. Forwards Derek Roy, Daniel Paille and Jason Pominville all have five points in their last three games. Maple Leafs forward Alex Steen has five assists in his last three games. 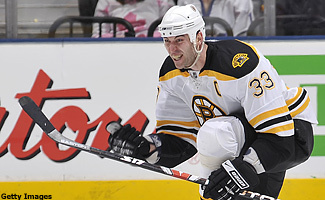 Boston's Zdeno Chara has reached a career-high point tally this season with 48. He has also tied his career-high in assists and goals. Boston – The Bruins are 1-2-2 in their last five games, but they may be getting some help as captain Zdeno Chara has been skating and practicing with the team this week and could return for the team's home-and-home series with the Canadiens that begins Thursday in Boston. Chara is listed as day-to-day with an upper-torso injury and will be a game-time decision tomorrow. General Manager Peter Chiarelli told the Boston Herald that defenseman Bobby Allen likely is out for the remainder of the regular season due to back spasms. Forward Patrice Bergeron (post-concussion syndrome), goaltender Manny Fernandez (knee), and defenseman Andrew Alberts (neck) all remain on injured reserve. Fernandez is practicing with the team and Bergeron is skating in no-contact drills, but Alberts has suffered setbacks recently. Buffalo – The Sabres' defense continued to take a beating last week when defenseman Nathan Paetsch suffered his second concussion of the season. They had just lost defensemen Dmitri Kalinin (shoulder) and Jaroslav Spacek (chest), who are listed as day-to-day. There was one welcome sight on the ice this week, as defenseman Teppo Numminen, thought to be out for the season after heart surgery, was skating and may be cleared to attempt a comeback this season. Up front, the Sabres are missing Tim Connolly (hip) and Michael Ryan (groin), who are both day-to-day. Montreal – Forward Steve Begin is day-to-day with a groin injury. Ottawa – Cody Bass (ankle) and Chris Neil (knee) are on injured reserve. Neil may be cleared to skate this week. Toronto – With the Leafs battling for a playoff spot, the injury bug returned at the worst time. Captain Mats Sundin has missed two games and remains day-to-day with a groin injury. Forward Nik Antropov is day-to-day with a knee injury. Forwards Mark Bell (broken orbital bone), John Pohl (sprained ankle), Darryl Boyce (dislocated shoulder) and Boyd Devereaux (torn right MCL) all remain on injured reserve. The Week Ahead – The Sabres host the Lightning Wednesday. On Thursday, the Canadiens look for their seventh straight victory against Boston in the first of a home-and-home series that concludes Saturday in Montreal. The Senators host the Blues. On Friday, the Leafs and Sabres hook up in Buffalo. The Bruins and Habs finish their home-and-home in Montreal Saturday night, and the Senators host the Maple Leafs. On Monday, the Senators are in Montreal for a key Northeast Division match-up. Tuesday, the Bruins are in Toronto and the Senators are in Buffalo.